Be the first to share your favorite memory, photo or story of Kim. This memorial page is dedicated for family, friends and future generations to celebrate the life of their loved one. Kim Ashbrook, age 59 of Burton, March 19, 2019. Making memories was very important to Kim. 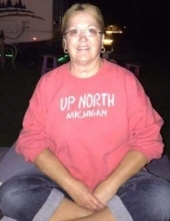 She loved spending time with her family and friends in Linwood during the camping season. Many times you could find Kim saving anything and everything she could, as she was an avid scrapbooker. Kim is survived by her husband Bob Ashbrook; her two children, Stephanie (Kevin) Gay and Adam Ashbrook; two grandchildren Landon Gay and Kinsley Gay; brother David Sisco. She was preceded in death by her parents Kathryn & Emerson Sisco. A memorial service will take place at Lynch & Sons Funeral Directors - Capstick Chapel, 542 Liberty Park, Downtown Lapeer, on Saturday, April 6, 2019, at 1 PM with a memorial gathering beginning at the funeral home at 11 AM. Pastor Drew Jolly will be officiating. Memorial donations to Kim's GoFundMe page are appreciated. "Email Address" would like to share the life celebration of Kim Ashbrook. Click on the "link" to go to share a favorite memory or leave a condolence message for the family.